Disney hopes to duplicate the success of Where's My Water? with Mittens, a tricky puzzle game starring an adorable cat by the same name. In it, the feisty feline sets off through four worlds in search of his dearest love, Mia. That said, each of the game's 75 levels task you with guiding this fur ball to a desired object, be it a bottle of milk in Milktown, or a red balloon in the circus-themed Balloon Land, picking up three diamonds per board along the way. How you get there, of course, is what makes this title so much fun, and tricky to boot. 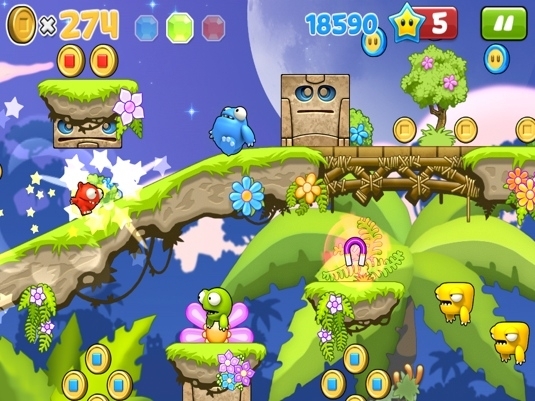 Similar to Chillingo's Cut the Rope, the idea is to use different objects within these environments to achieve the ultimate goal of not only gathering those precious stones, but also the aforementioned item. As the saying goes, it's all in the timing, and you should plan as many moves ahead as possible. With this in mind, credit goes to the developers for dreaming up so many imaginative brainteasers. Throughout the course of this challenging game, Mittens will bounce off trampolines, slide along canopies and hitch a ride on some birds. This level of interaction also extends to cutting pieces of wood to form makeshift vehicles, and preventing angry humans from hitting Mittens as he passes by. 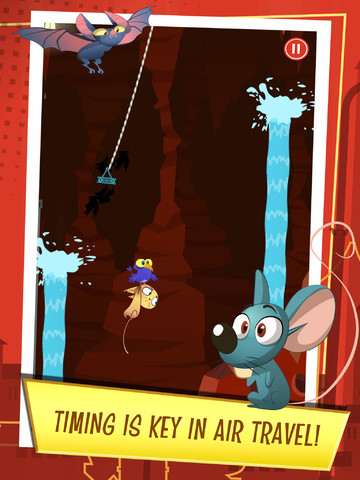 The difficulty spikes (as expected) the further you advance, but the fact that Disney allows you to restart any time lends to the game's overall addictiveness. Most times, we're not happy with just one or two diamonds. We want all three. Our desire to continue playing has just as much to do with the visuals as it does the puzzles. We couldn't help but fall for Mittens, while the attractive 2D graphics and whimsical music help create an experience that's as much fun to watch as it is to play. We have a couple issues, however, the first dealing with bigger stages. For whatever reason, Disney forbids players from scrolling to view entire levels, thus preventing them from mapping out an all-encompassing strategy. It's a minor complaint, really, but something we'd like to see in future worlds. More bizarre is the separation of iPhone and iPad (think HD) downloads that cost $0.99 and $2.99 respectively. With more games debuting as universal for both devices, this is disappointing to see. Aside from that, Mittens is a digital delight. Not the most revolutionary puzzle game, but one that Disney did a great job designing, and similar to Where's My Water?, an app that will continue to evolve throughout the year. If you can't get enough of these types of games, downloading this one is a no brainer. Review code provided by Disney. What's Hot:Four imaginative worlds with 75 levels to master, expertly designed puzzles, appealing hero. What's Not:Unable to scroll to view entire levels, you must pay to unlock the fourth world, iPad version costs $2.99.